SnowAffair's backcountry adventures are guided trips to some of the world's most amazing spots. Each trip is unique and usually one-of-a-kind; never-to-be-repeated. The trips provide once in a lifetime opportunities to experience the ultimate adventure. The terrain and exposure level on these trips is not extreme. We search for the truly unique trip that offers eye-popping scenery combined with mouth-watering conditions. The focus of each adventure is sliding on snow. Skiing, snowboarding, snowkiting, and touring are the main goal on each trip. Add to that list the following for something truly unique: kayaking; sailing in a 60' sailboat to get to the riding; eating the one item on a menu: whale; soaking in a hot spring located on the Arctic Circle; or claiming your own first descent. The price for each trip varies and the total cost is split between participants. On our 2006 Backcountry Adventure to the Himalayas of Pakistan we met with Prime Minsiter, Shaukat Aziz, who said to us, "I have been to St. Moritz and to Portillo. I drank tea there while sitting in my fur coat next to the ski lifts. We do not want that here in Pakistan. We want our mountains to remain natural for use by backcountry enthusiasts". Pakistan is home to many of the highest mountains in the world. Below is a brief description of the Backcountry Adventures. Please Contact Us for more information. Thompson Pass Alaska: Road tripping with RVs in the heart of Alaska heli-ski territory for the purpose of some of the finest snowkiting and backcountry riding on the planet. 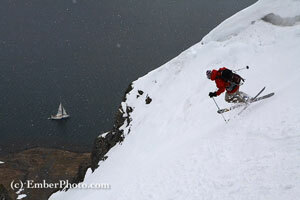 Tele-Heli Alaska: Imagine the steep and deep, run after run, on this telemark specific helicopter skiing trip. Bring your posse of free-heel buddies to nirvana for a true freeing of the mind. If your mind has already been freed and you want to ride locked in or snowboard, that's cool with us. Greenland: Backcountry riding and snowkiting in southwest Greenland. This trip can be tailored to the desires of the group. We can stay in a four star hotel located in the fishing community of Maniitsoq. We can base on the ship Kisaq as we travel to new heli-ski destinations along the coast. We can also choose to experience a 'home stay' option in an Inuit village. Iceland: Backcountry riding and snowkiting in the West Fjords of Iceland. We will be staying aboard the 60' sloop Aurora. The boat will be our warm, mobile basecamp as we fjord-hop this spectacular location. This was our winner from last year's tours and we just have to do it again. Unreal. The SnowAffair Snowkite Rallys are a variety of events held across the country that can include free snowkite instruction, free equipment demos, and freeride sessions with the snowkite community. The explosion of snow kiting onto the winter scene has opened a whole new, vast playground for skiers, snowboarders, and telemark skiers. 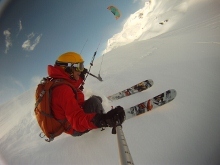 A snowkite can be used to access remote areas, to ascend mountain peaks, to cruise on local fields and frozen lakes, to jib with a multitude of park-style tricks, and to catch huge air. Some of the snowkite rallys will provide free instruction and free use of a snowkite. Some locations will also provide skis and boots for participants. Certified instructors will demonstrate the safe use of the kite. All of the kites used in the program are state-of-the-art Ozone SnowKites. Please Contact Us for specifics on each rally. The instructional staff has extensive snowkiting and snow sports teaching experience. They have snowkited in places from Minnesota to California as well as the Alps in Europe, the Pakistan Himalayas, Iceland, and Alaska. In addition, they are top competitors in a wide variety of snowkite events. "One of the coolest aspects of snow kiting", says dedicated snowkiter and tour organizer Ken Lucas, "is that you get first tracks in powder all day; catch huge air; and ride the backcountry for hours without ever hiking". The SnowAffair rallys are a great opportunity to learn the sport of snowkiting and ride with the "tribe". SnowAffair is an exciting nationwide tour of instructional telemark skiing clinics with free use of high quality ski equipment. 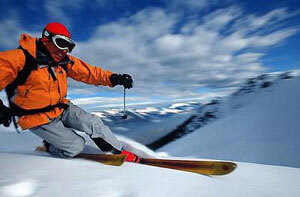 SnowAffair has been offering high quality telemark ski instruction for over 10 years through its TeleFair Tour. Skiers, snowboarders, and telemarkers can participate in the SnowAffair clinics. First time telemarkers can easily learn the telemark turn on the new generation of telemark equipment. Beginner through advanced telemarkers can learn new techniques to maximize their fun on the new gear. Professional instruction is provided by some of the best telemarkers in the country. Highly certified instructors, national champions as well as extreme skiing competitors will all provide instruction. Learn the basics and touch upon other more advanced subjects like: powder, bumps, air, kite-skiing, or backcountry tips. State-of-the-art telemark skis, telemark boots, and poles are provided free for all SnowAffair participants. Learning to telemark ski is very easy with this new generation of telemark gear. For only $60 per day each participant will get 2 clinics: Free use of skis, boots, poles and a ticket in a raffle drawing. Discount lift tickets are available to all SnowAffair participants. Register now! Private session can be arranged by contacting SnowAffair.